I have to say I’m loving these reads, they’re anthologies of novellas or long novellas as you’d like to call them, short enough to be real sweet but long enough to have a satisfying plot. The three stories together made for an interesting read, but since you can get them on their own too I’ll talk about each. We’ll Be Home for Christmas by HelenKay Dimon was my favorite read of the anthology, we’re talking 5 butterflies material. Lila and Spence were both intense and juicy characters, and their chemistry was off the chart awesome. This is a personal preference of course, but I liked their story the most because they have salt and pepper and the romance is fraught with conflict – making it very realistic in my opinion. Their interaction was really fun and the way their relationship evolved had a great impact on both of them. They had a great, great sense of humor, the both of them, and their one on one scenes sizzled because of their chemistry. I’m most assuredly looking for more HelenKay Dimon works, I loved the way she built her characters, the voices she gave them, the pace of events in the plot and how she tied everything in. Ask Her at Christmas by Christi Barth was a scenario that I’m not exactly head-over-heels for, the best friends to lovers one. Again, this an entirely personal thing, I get the chills when I read stories on that scenario because I’ve had the dubious pleasure of losing best friends to the whole “I’ve fallen for you” thing, and it wasn’t fun at all. But anyways, if you like that scenario, this is the read for you. Caitlin and Kyle didn’t really reach me for some reason. Each of them on their own and their interaction somehow flew over my head and I didn’t react to neither of them or the situation. But then again, it could be all the scenario’s evil influence, when I’m not liking something characters have to be extra cool to shine for me. This was an interesting read but it didn’t hit me much after reading the first. The Best Thing by Jaci Burton was fun in places, the chemistry between Tori and Brody was really cool as far as I was concerned, up to a point. I’m not sure why, but since they got together their spark lost some of its intensity for me. The scenario was interesting and I was curious to see what would happen to them, but at the same time there was something about Brody that I didn’t really fall for. Tori was cool but I felt she was more on fire somehow the he was, so he sort of failed to reach me all the way. I liked reading about them but I wasn’t crazy about them, sadly. I’ve read other works by the same author and liked them but this one wasn’t as powerful for me. All in all I say this anthology was a cool read, it had some of that conflictual romance I always swoon over, some sweeter romance and different scenarios, a good mix. If you like conflictual romance like I do, I seriously recommend you read HelenKay Dimon’s We’ll Be Home for Christmas, it was really awesome. 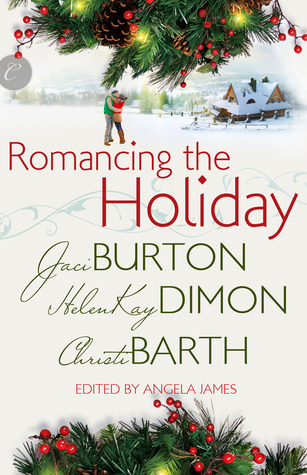 But if you’re looking for a good mix of scenarios and types of romances, get this anthology.